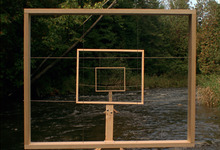 Three grids are placed along the Credit River in rural Ontario. They become devices through which the stationary camera, pointing upstream, delineates the landscape. They motivate the movement of the zoom, which intensifies our sense of the field of view, narrowing vision and flattening space. The river, framed momentarily, flows past. Financial assistance provided by the Toronto Arts Council.